THE GREEN GATE..— Mr. Nicholas Clarke, formerly landlord of the Union Inn, and subsequently of the London, has taken the premises on the Sand-hill known as the Green Gate, and intends, we understand, lo apply for a license for them at the next meeting of justices. A license was a short time back applied for the same house and refused — why, we are not aware. The house in question is situated about midway upon the rise of the Sandhill and in an excellent position for a house of entertainment. It would not only be a great convenience to travellers, but protection also. The main consideration in such a locality is to have a landlord in whom the magistrates have confidence, and such an one, we have every reason to believe, is the present applicant. On Mr. Clarke’s applying for a licence for the Old Green Gate, he was opposed by several of the members, who seemed to consider that he was making a traffic of the good reputation he had succeeded in establishing for himself in the capacity of a licensed victualler, Mr. Rocher, who appeared in support of the application, defended the conduct of his client, and contended that he had quilted the London Tavern merely from prudential motives, having, as it appeared, made the discovery that in resigning the Union for the above-mentioned house, he had made an unprofitable exchange. The licence was finally granted. The Cuisinery preparations for persons visiting Launceston during the Supreme Court and other sittings, are getting to much perfection. In addition to Mr. Saunders of Brisbane-street, whose cookery is confessedly beyond all praise, and whose excellent basin of mock turtle is liberally patronized by his friends. Mr. Sullivan of the ‘Wilmot Arms,’ is getting an enviable reputation for his judicious catering for human appetites. An Ordinary from 11 to 4 daily, pursuant to Mr. Sullivan’s new arrangements, has been honored with numerous guests, and the gravy soups of mine hostess has been in large demand. 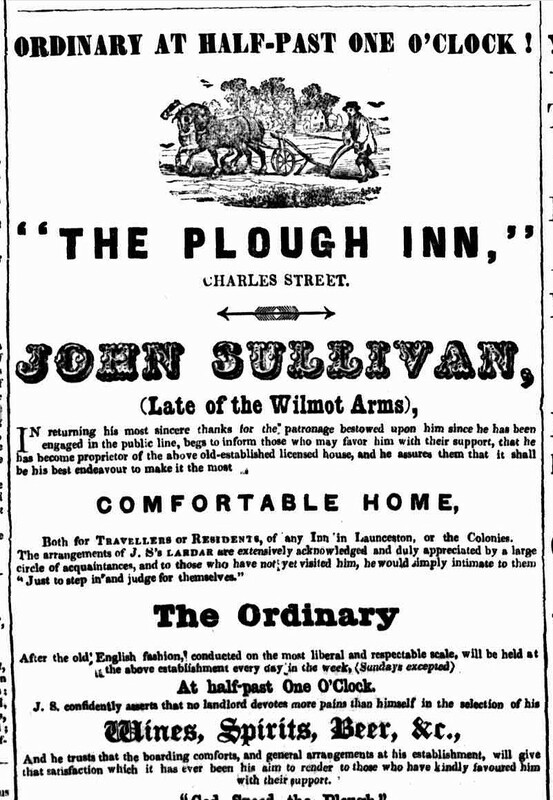 At the ‘ Wilmot Arms’ the accommodations are found to be equal to those expressed in Mr. Sullivan’s advertisement, to which we cannot do better than refer our readers. AT an early hour yesterday the inhabitants were in motion. The shops were closed, colours mounted, and two of Mr. Page’s Hobart Town coaches, and two of Mr. It. H. Douglas’s Westbury coaches-bung with blue, and the horses decorated with trappings of the same colour-drove round the town. Much excitement was manifested round the polling-places; but from threats which had been industriously circulated subsequent to nomination day, a disturbance was anticipated. Every thing went on quietly for nearly two hours, when several men resolved, and prepared, to defend their colours were assailed by a number of the other party, who sallied out of the “Bull’s Head.” Some thousands or Mr. Dry’s supporters instantly gathered round. The fight, though short, was severe; sticks were applied with much energy and dexterity, and Mr. Douglas’s friends were driven back into the place from whence they issued- One or two of the more nimble then mounted on the roof of the building, took down the tri-coloured flag, and threw it to the people, who tore it into ribbons. The windows were demolished. A false account of the state of the poll was exhibited at this public-house. Inflamed by this, the crowd proceeded up the principal streets, and either pulled down the obnoxious flags, or their owners struck them in self-defence; thus in the short space of a few minutes not a single flag of Mr. Douglas’s party could be seen. After much trouble, Mr. Dry brought the excited crowd to Bell’s room, and harangued them from an open window. He beseeched them not to sully their first election by deeds of violence, but to show their superiority and confidence of success by peaceable and orderly behaviour. The salvation of Mr. Joseph Nathan’s shop, stock, and building is solely to be attributed to Air. Dry’s interference; the owner fled for safety to Mr. Dry’s quarters, the Cornwall Hotel. Three cheers were then given for Mr. Dry, and the crowd dispersed into small groups. Unfortunately, the land- lord of the “Wilmot Arms,” with more obstinacy than prudence, again hoisted his tri-colour, and, having conveyed a quantity of bricks and stones on the roof of his house, brandished two or three guns in defiance, Information of this was given to the deputy-returning officer of the district, but he stated he could not interfere ; the chief district constable was then made acquainted with the circumstances, but he replied with surprising forgetfulness of duty, that a man had a right to defend his own house. Shortly after another row occurred, by the unjustifiable interference of the police, four or five of whom attacked a man who was carrying round a board setting forth the state of the poll. The man was rescued by the crowd, but he was very much injured about the head. 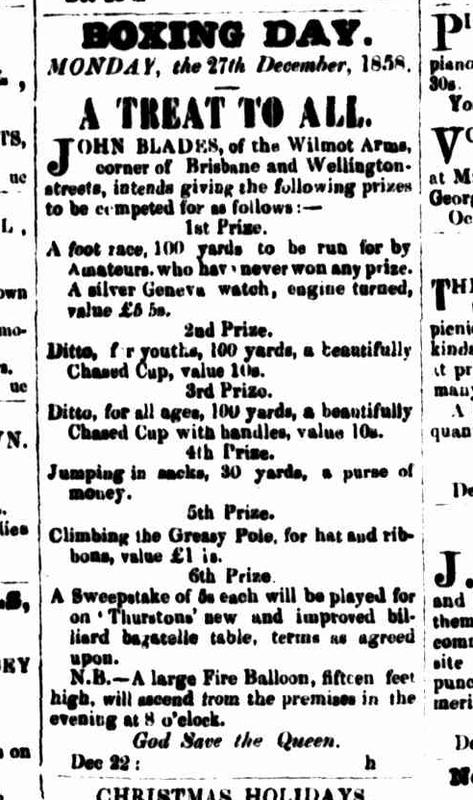 Whilst the contest lasted there was no possibility of restoring order, and Mr. Douglas, finding himself at two o’clock in a minority of 403, wisely determined to retire. Accordingly about three o’clock, the two candidates rode up Elisabeth-street, and shook hands at the corner of that and Charles-streets: Mr. Dry proceeded amidst tumultuous applause to the sole occupation of the hustings, and Mr. Douglas returned home, followed by loud and continued groans Mr. Dry requested that all the blue flags should be taken down at four o’clock. 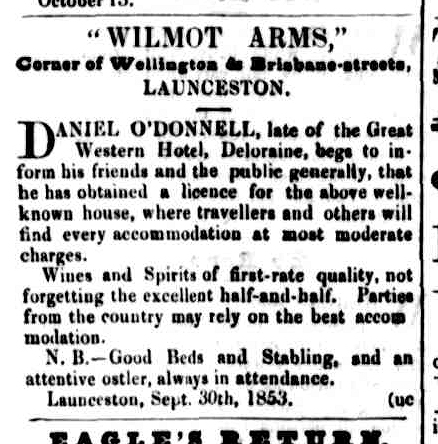 From Daniel O’Donnell, Wilmot Arms, Brisbane and Wellington-streets, to George Summers. No objection to either party. Granted. 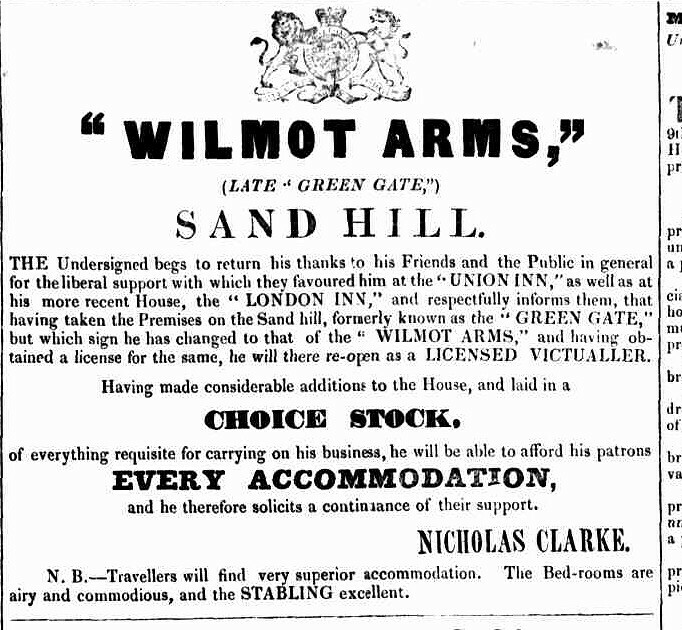 The same auctioneer sold (yesterday) the residue of the lease (four years and nine months) of the Wilmot Arms Inn, to Mr. Blades, for £605, subject to a rental of £100 per annum. The Police Magistrate said that there was no objection to the applicant but tho house was of the old class. The applicant promised to repair his premises. Granted. A. J. Green, Wilmot Arms, Brisbane and Wellington-streets.-The Mayor remarked that this was one of those houses not at all adapted for a public house. They ought to be burnt, destroyed, or pulled down. 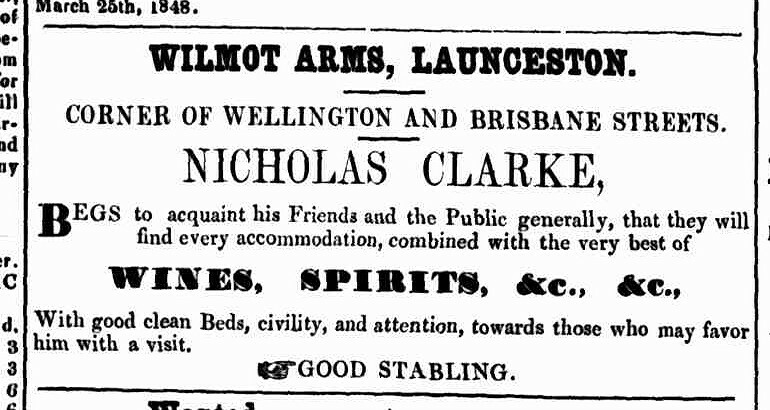 Alfred John Green, Wilmot Arms, Wellington and Brisbane-streets.–The Superintendent of Police said there had been several informations, and two convictions, against the applicant during the past year. The convictions were for permitting ingress and I egress to disorderly women after midnight, and for permitting music I and dancing in his bar. On the occasion of the visit of his Worship the Mayor and the Superintendent of Police on 22nd ult., applicant was not in a fit condition to conduct his business.–Applicant said his house was more immediately under the super vision of the police than any other house in town, and that was the reason there were so many reports. He explained certain portions of his conduct, and said he was a new hand at the work, and would improve during the coming year.–The Superintendent said he had never seen applicant the worse for drink except on that occasion.-Granted with a caution. 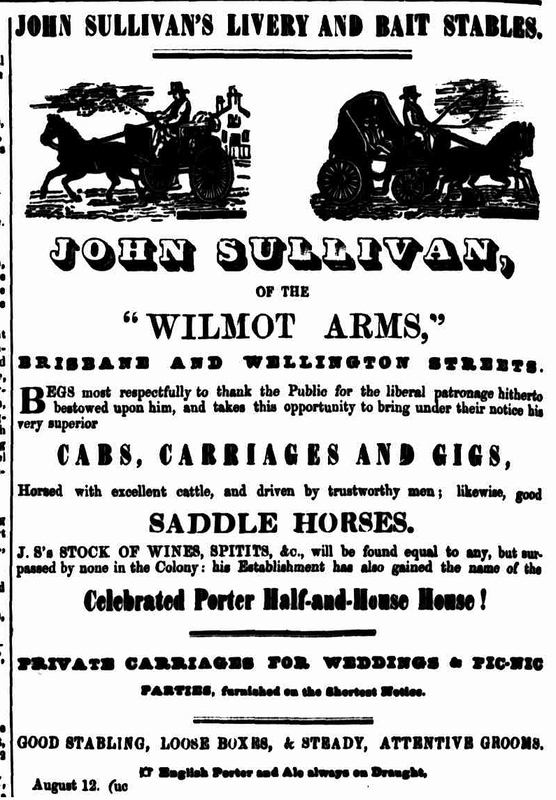 The Wilmot Arms, Brisbane and Wellington-streets, from Mr Alfred Stephen Harris to Mr John Sullivan. Mr Douglas said this was one of the houses that had been condemned many years ago by the Bench, as only a grog shop, without affording any accommodation to the public, and it would only be fair to Mr Sullivan to inform him now, that unless his house was improved the license would not be continued to it. 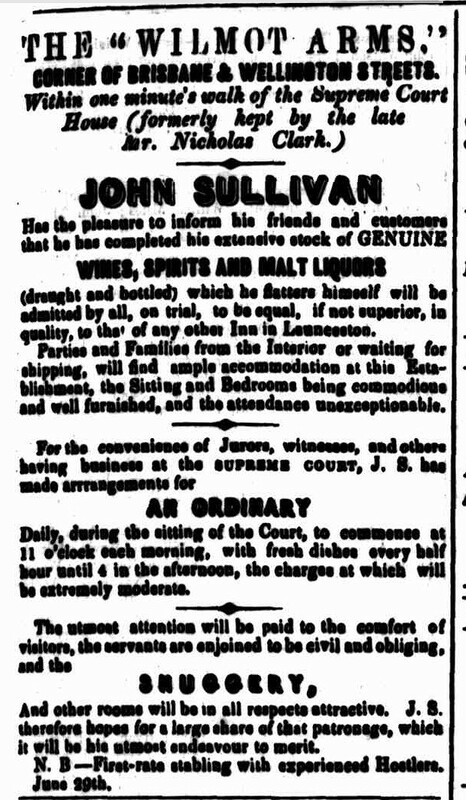 The Chairman told Mr Sullivan that the house would be visited before the meeting for granting licensee, and he should see that the house had proper accommodation, or the license would not be continued. The Mayor said there had been no convictions against the holders of the license during the year, but he had received several complaints, showing that it had not been well conducted, and about a fortnight ago there was a very considerable disturbance in the house at on early hour in the morning. Mr Dowling said when he had more to do than now with the conduct of such houses, he had known the Bench years ago to only grant a license to this house on condition that it should be put in repair. The Chairman said that formerly the Bench had the advantage of very full and minute information from the late police magistrate, Mr Gunn, as to the state of each house, and the conduct and character of the applicants for licenses ; but in consequence of a former Mayor undertaking that duty, Mr Gunn had given it up a few years before his death, and the Bench had not been so well informed since, the questions being limited to the fitness of the premises and the character of the applicant. Mr Coulter said this house was in a disorderly neighbourhood ; he had heard some complaints of it lately — one as late as last Saturday night— but the facts were not so clear that he could found an information upon them. Mr Dowling said he believed if the agents of the house knew the feeling of the Bench they would improve the premises before the annual meeting. Mr Coulter said until the Bench laid down some special resolution for their own guidance in such cases, it would be difficult for him to report to them specifically. Dr Ranson said he thought the Chairman was slightly in error on one point, for since Mr Gunn discontinued his reports, he had seen the Mayor for the time being visiting all the licensed houses. Prior to the annual meeting of Justice’s, he knew that Mr Douglas and Mr Scott had visited when they were in office, in turn, as Mayor and if the practice had been omitted it could only have been for last year. he Chairman said the Bench had not received as fall information respecting each house, and the communication with it by back premises, since Mr Gunn had given up the practice. They had never received the information in the same form since. Mr Mason said he was quite willing to assist the Mayor in furnishing such information to the Bench. The Chairman said the transfer was granted and stated again on what conditions next annual license could alone be granted, that the premises must be improved. Wilmot Arms, Brisbane and Wellington streets, Michael Lawler applicant. The Clerk of the Peace read tine resolution carried at the last meeting asfollows:–Whereas several ipublic-houses in this town, which have been licensed for a number of years, have fallen into a dilapidated condition, it is the opinion of this Benchs that the licenses should not be renewed at tile next annual licensing meeting unless thie premises are put into thorough repair in thie meantime; and the justices present resolve to refuse tihe licenses unless this matter be attended to. The application was consequently refused. Wilmot Arms, Brisbane-street. Michael Lawler, applicant. Mr Coulter explained that this was the old Fire Brigade Inn, which had been closed owing to family differences. Mr Lawler was the occupier of the Wilmot Arms at present, and he purposed calling the house he now applied for by the same name. He had no objection to it either the premises or applicant. REMOVAL OF AN OLD LANDMARK. Another of the old buildings which have been associated in the minds of residents of long standing with the scenes and episodes of a past half century has been demolished. 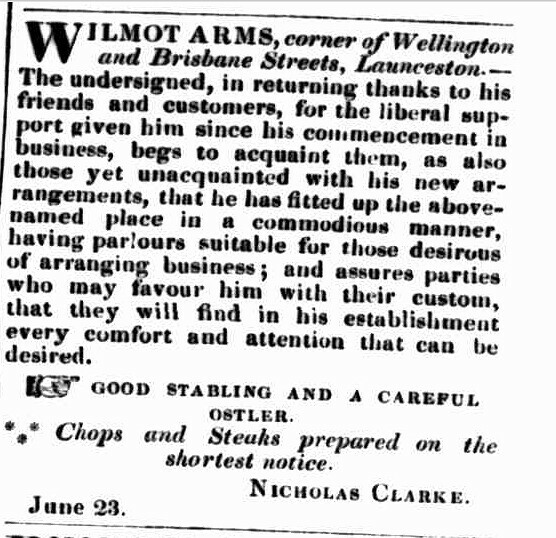 The place to which reference is made is the late Wilmot Arms, which stood for very many years at the corner of Brisbane and Wellington streets, It is too long ago for the memory of ordinary living men to recollect when it was built, or who was the first occupant; but come of the old colonists can still dwell with pleasure on the reminiscences of what used to take place on election days in the earlier history of the city. They vividly retain some of the exciting events which transpired when hot contests resulted between the late Sir Richard Dry and Hon. Adye Douglas, the present President of the Legislative Council. One or two persons there are, however, who can revive still older accounts of the occupants and their lives, and from these the following facts have been casually gleaned. Of course it must be borne in mind that the data to go upon is simply the memory of man, and that at all times is apt to be a little deceptive. Nearly fifty years ago the hostelry in question was the Black Swan, and at that period it was licensed by a man named Daniel O’Donnell, who did a thriving business in those coaching days, which persona say were so much more money-making than the present are. He was succeeded by a man named Clark, who at his death left the business to his widow. A constable named Sullivan then became enamored with the landlady, and proposing marriage he was accepted. A constable’s tedious and somewhat dangerous life was thus changed into that of a publican. 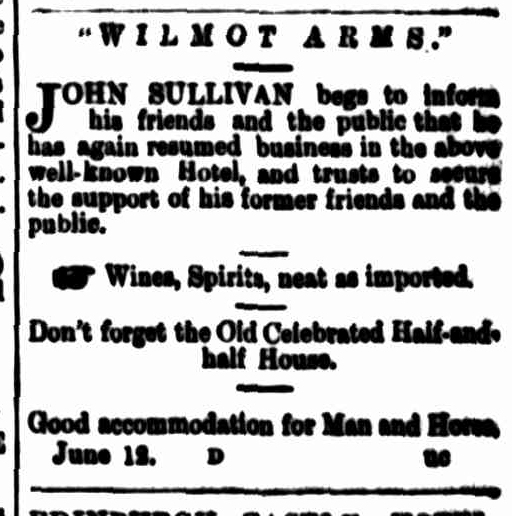 Success appears to have followed Sullivan in those days, but being dissatisfied with the name of the Black Swan he changed it to the Wilmot Arms. He sold out his interest to William Blades, and went to the Plough Inn, at that time a fine hotel in Charles-street, now occupied us an ironmongery warehouse by Messrs. Wm. Hart and Sons. After a lapse of some years Sullivan went to New Zealand, where, it is stated, misfortune awaited him, and he returned to Launceston. 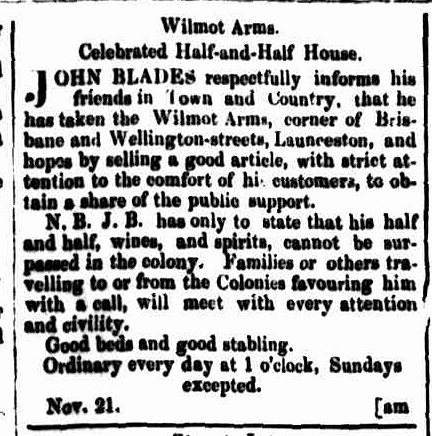 Having in former times the command of a large business in the Wilmot Arms, it was thought he could again offer sufficient inducements to resuscitate the then decaying favor of that hotel, and he was eventually enabled to buy out Blades. The expectations were not quite realised, however, and some 21 years ago he sold out to Mr Michael Lawler, the present licensee of the Victoria Hotel, Elizabeth-street. Mr Lawler remained in possession for 15 years. Since 1882 the building has not been licensed, and after being empty for some little time Mr Williams, cab proprietor, took possession, and he remained there for some years. He left it for four years, and again became tho tenant until some two years ago, when it was subsequently taken by another cab proprietor, Ur Wallace. He removed, and the old house became tenantless. It belonged to the Solomon Estate, and while empty it was gradually allowed to decay and become dilapidated. The windows were broken, the fences were in a bad way, and same two weeks ago what remained of an hotel which had seen many changes, and the proprietors of which had experienced many ups and downs during their colonial careers, was demolished. The allotment of land is an exceptionally good building site, but it is now vacant, a new paling fence having been erected to keep trepassers off. Mr. Lawler was the only surviving member of the family of the late Mr. and Mrs. Michael Lawler. 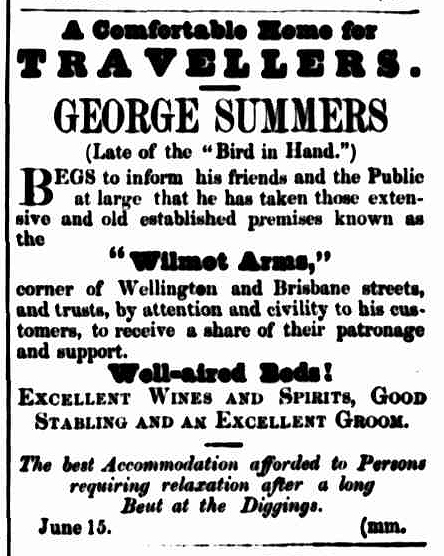 His father was an hotelkeeper in the early days, and opened the Wilmot Arms Hotel at the corner of Brisbane and Wellington streets. Subsequently he took over the Fire Brigade Hotel (now Imperial), In Brisbane-street, and later the Victoria, subsequently changed to the Burnie Hotel, in Elizabeth-street, the present site of the Trades Hall. 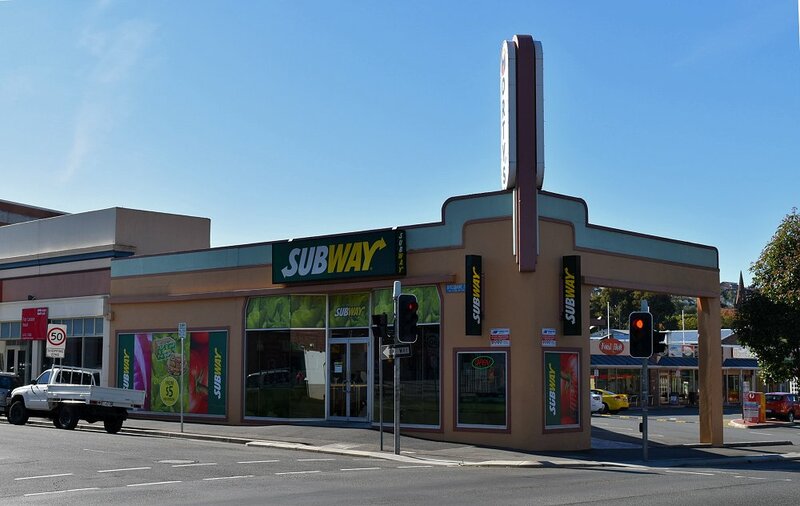 This entry was posted in Brisbane Street, Hotel, Sandhill, South Launceston, Wellington Street and tagged location, long gone, no photo, photo by Xenith. Bookmark the permalink.